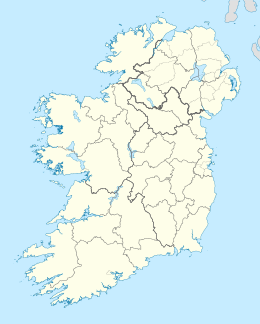 Island for which the nearby village of Dalkey is named (Irish: Deilginis meaning "thorn island") the uninhabited island lies about 16 km (10 mi) south of Dublin3 km (2 mi) south of Dún Laoghaire harbour. An important site of pilgrimage for centuries, it has been known as "St Begnet's Isle" since records began. The earliest reference to 'Dalkey Island' is from c1782. The Island had a population of 8 in 1841. The island is currently uninhabited but there is evidence of human occupation dating back to the Neolithic period. The remains of field systems, a church, a 'cairn' burial, a gun battery and the Martello Tower still exist. There are two Holy Wells, one on the Western shoreline is known locally as the "Scurvy Well" and is located within a surrounding stone structure. There is also a bullaun stone formed from an earthbound boulder. This may have been used as a pagan alter as it was 'Christianised' in the 7th century by carving an early Christian cross on the face. This lies close to the remains of the church. At the Northern extreminity of the Island there is evidence of a deep ditch or fosse that was the boundary of a medieval Promontary Fort. Located less than 300 metres off the mainland, the island comprises 9 hectares (22 acres). From Bulloch Harbour, it is possible to visit the island. Also a regular ferry operates from Coliemore Harbour Irish: Calach Mor meaning 'Big Harbour', during the summer months. Dalkey Island, only 5 minutes by boat from Coliemore Harbour, is an important site of ancient and historic remains. Artefacts from the island, now housed in the National Museum in Dublin, provide evidence that the island's original occupants were from the Mesolithic, or Middle Stone Age. Humans continued to use the site through the Neolithic, Iron Age and Early Christian period. There is evidence it was inhabited in the 4th millennium BC (6,000 years ago) and was also used as a Viking base. A number of early Medieval pieces of pottery and glassware were found on the island. Some of these artifacts came from Mediterranean area, possibly Turkey or Greece. It was an important site of pilgrimage in the medieval period as evidenced by the prominence of the island on early maps. One such, Danti's map of 'Isole Britaniche' painted on the wall of the Palazzo Vecchio in Florence (c1560) survives as a remarkable record. It was believed that 'taking' water from the well attributed to the saint could cure scurvy. Recent tests to the water show that it has high levels of vitamin C (the cure for scurvy), probably due to its position below a salt marsh. There are ruins of a church, dating to the 7th century which is named for St Begnet. An older wooden church was probably here before the present stone one was built. Another church in nearby Dalkey also named for St Begnet may have been a 'base' for pilgrims before they crossed the sound to the island. 'Pilgrim badges' would have been sold in the town which would be eventually sewn into their burial shroud to prove that they had undertaken the pilgrimage, helping their journey through the gates of heaven. On the orders of Henry VIII as part of his dissolution of the monasteries, St Begnets was raided in 1539. The ornaments and plate raised 36 schillings for the crown. In the early Christian period, the town of Dalkey was called Kilbegnet. The earliestt reference to 'Dalkey Island' is to be found on a map printed for 'Barnard's New, Complete and Authentic History of England’ printed c1782'. This was about the time that the island was becoming a site of British military ordinance. There is also a reference to it on a copy of the Downs survey of about the same time. The church on the island was altered during this period on the east side, when builders used it as living quarters while building the nearby Martello tower and gun battery in 1804. .
Extensive archaeological excavations took place in the late 1960s (Liversage) which uncovered evidence of a churchyard and a number of burials. The skeletons were not exclusively male, as has been suggested but they were in the majority in keeping with the fact that it was an early Christian Monastic site. A promontory fort designed to help protect what was the main deep water port for Dublin, now called Coliemore Harbour Irish: Calach Mor meaning 'Big Harbour', in the medieval period. was located at the northern end of the island, its presence still visible today in the form of a ditch. The remains of a child (probably a plague victim) were discovered, discarded rather than buried in the ditch during the 1968 excavation. The remains may also have been that of a young Viking slave (comparisons to the remains found in Llanbedrgoch on Anglesey would suggest this) but accurate dating tests have not yet been carried out. The channel between the island and the mainland is very deep. 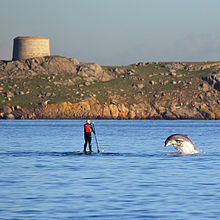 The waters around Dalkey Island are much used for sailing, angling and diving. Rocks known as Maiden or Carraig Rock, Clare Rock and Lamb Island all to the northwest form part of the ridge of the Island. Parts of these rocks are only visible at low tide. The southern end of the Island is a favorite with kayakers especially on the flooding tide. There can be a substantial overfall here and in a south east wind can be extremely challenging for the kayaker. When kayaking around the Island on a flood tide it is easier to go in an anti clockwise direction. Dalkey Island is home to a colony of seals which has greatly expanded in recent years. Black rabbits and herd of wild goats live on the island also. Birdwatch Ireland have established a colony of Roseate Terns on Maiden Rock just north of the Island and Ireland holds most of the European population. The Rocks to the east of the Island are known as "The Muglins" and are a different group or chain. These form a danger to shipping and have been fitted with a distinctive beacon. The beacon stands on the site of what was once a 'gibbot' where the bodies of two pirates, Peter McKinlie and George Gidley were displayed following their execution for the murders of Captain Cockeran, Captain George Glas and his family and others on board the ship 'Earl of Sandwich' in 1765. Their remains lie buried under the concrete plinth base of the beacon. ^ Doyle, Ian W. (1998-01-01). "The Early Medieval Activity at Dalkey Island, Co. Dublin: A Re-Assessment". The Journal of Irish Archaeology. 9: 89–103. JSTOR 30001694. ^ Walsh, David (2014). Oileáin. Pesda Press. p. 53. ISBN 978-1-906095-37-6. This page was last edited on 15 January 2019, at 02:24 (UTC).